Check out my other Patterns for Sale, or try these! If you like then you ought to put a hen on it! 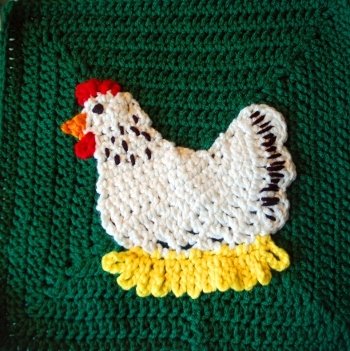 If you have the urge to add a hen on a nest to anything at all, this applique is for you. Made with an H hook and worsted yarn, it's about 7" wide and 6.5" tall; it could be made larger or smaller with thicker or thinner yarn and a different hook. Applique is shown on a 12" square. This hen is modeled after a Delaware hen! Copyright 2007-2015 Melissa Mall. All rights reserved.